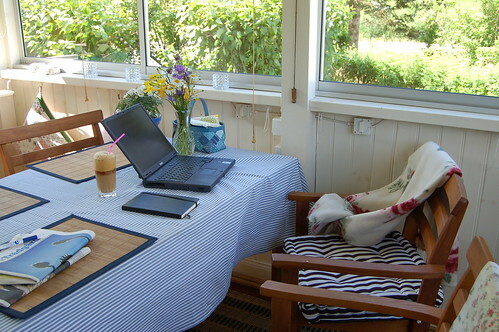 Inspired by the photo Hanne took of her garden office I took this photo of my office this week. I love this room so much, it’s like my only home right now. In the summer we have every meal out here, even breakfast on rainy days because then dad turns the heat on and closes the windows. I’ve been sitting outside uploading images and looking through your blogs, drinking iced coffee (frape) and writing some by hand too or picking up the book I’m reading right now. I’m writing in my Moleskine diary almost daily right now. Complaning, raving. drawing (not much) and trying to figure things out. The pages really helps me a lot. 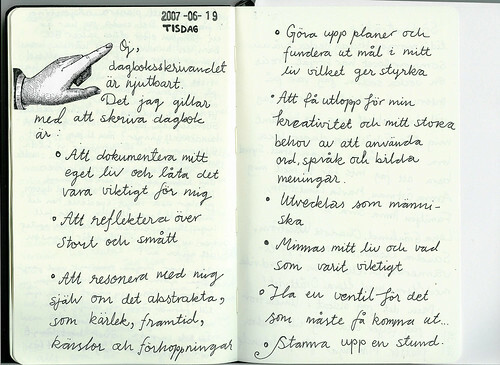 Below is a scanned spread about what journaling means to me (in Swedish). I recently read somewhere about how important journaling can be, and it made me think about who writes and who doens’t and if there is a difference in our life. I think so, in a lot of different ways. I for example belive that I, who have been writing a diary my entire life, know my taste, my goals and what is important to me better because I’ve written so many pages about my life and these subjects. Over and over again. Putting my pen to paper has made me a better person in many many ways I think. What do you think about keeping a diary? This entry was posted in A Creative Life, Creative habits, On writing. Bookmark the permalink. I really enjoyed your post. And aren’t Moleskine journals the best? I just love the feel of that paper, how my pen glides on it..
Hanna, jag tycker definitivt ocks? att dagboksskrivande ?r v?ldigt givande! Just nu blir det visserligen inte mycket av det. Framf?r allt beror det p? tidsbrist, pga sm?barnslivet jag befinner mig i. Det uppfyller mig ocks? med en slags tillfredsst?llelse, samtidigt som jag k?nner mig hyffsat tillfreds med mig sj?lv numera. Men under perioder har dagboskskrivandet varit en ventil n?r jag g?tt igenom sv?rbearbetade h?ndelser eller funderar p? obegripliga relationer. Dagboksskrivandet har ?ven varit ett medel att dra upp m?l, f?rv?ntningar och beskriva dr?mmar jag har. En kul sak, var n?r jag var singel senast. D? skrev jag upp en “kravlista” p? hur min (blivande) man ska vara. Funderade en hel del p? det och listan utvecklades med det. Tittade p? den senaste listversionen en kort tid efter att jag tr?ffat min nuvarande man – och ins?g att matchningen var perfekt. Och det var extra kul att kunna checka av listan och k?nna att jag hittat den man jag s?kt efter. S? visst har dagboken varit ett starkt st?d i mitt “levande”. Om jag hade mer tid skulle jag dock g?rna skriva ner insikter jag f?r inte minst som sm?barnsmamma och jag skulle vilja dra upp framtidsvisioner, dr?mmar och m?l jag har f?r att f? dessa mer klara f?r mig. Ha en fin midsommarhelg! Det ser underbart fridfullt ut i ditt kontor! I’ve been thinking about honesty in journalling. Honesty to oneself is always important of course, but a journal, as reading material for your future self, and perhaps for others if you choose to share it with them, is a medium through which you convey your selfhood. I think there is room for making yourself feel better through it by writing yourself as what you think of as an attractive person (you don’t even have to lie to do this; connotations can do it all). But further than this, I’m quite open to writing down events that never happened, perhaps ones that would never happen or that I’ve lived only in my mind. I’ve found, crazily, that sometimes these do take place, later on, perhaps in some other form, and probably because I thought & wrote about & became responsible for them, but nevertheless, is that not a form of self-betterment? Becoming your alter ego? Or even re-writing your own history if your memory is as weak as mine? I love your garden-room, and your handwriting! what alovely room to write in! Such a beautiful, sunlit room… if I had a room like that, I’d write every day… oh, excuses excuses! … actually, I do write almost every day. I’ve kept a journal since I was seven (which was actually a Nancy Drew diary); I am not sure I can even say what it means to me since it’s been such an integral part of my life. But I can tell you that when I don’t write in a journal regularly (I’ve occasionally gone up to six months), I start to feel very fragmented. I understand my own feelings better if I write them… In fact, it’s almost as if writing is how I actually process my life, like some people dream. Because my minute-to-minute thoughts are very analytical, very curious, very problem-solving, and rarely about myself (I’m one of those people who’s constantly still asking “Why” like a little child… why is the sky blue… why is the bridge built like that); my journal writing is almost all emotional. I guess it’s where I get in touch with myself. Sounds so cliched, but it’s true. Sorry, I guess I just wrote a blog post. I might have to steal my own comment back for that very purpose. I am so pleased I stumbled across your blog, via RadioGirl. 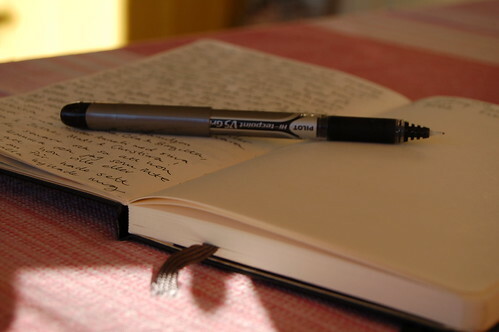 Both you and your visitors go some way in making sense of journalling, and I now see it’s more than diary-entries. Think I’m getting closer to giving it a go. S? smukt et rum, helt vidunderligt!!! I det hele taget ser der rigtig dejligt ud i dine for?ldres hus og have! I once read somewhere that one who keeps a journal has a narrated life – a life with an extra layer…. I like that. Hello :) You have beautiful room to write in it :) And I have a diary too :) I write my diary since I was a child :) It means so much to me! Take care and send you warm wishes from Poland! Vad fint! Jag skriver ocks? n?gra rader varje dag. S? skriver jag ?ven i barnens b?cker. De har varsin bok f?r sm? h?ndelser, hyss och framsteg. I wrote a diary when I was little, but not now. I would like to have one, but I’m not good in expresing my thoughts on paper.